Have you been alienated from your grandchildren? You're not alone. Unfortunately there are millions of Invisible Grandparents out there just like you who have been blocked from passing on their love, values and memories to those who mean the most to them. But don't give up. There is a way for you to leave a legacy of love whether you can be there or not. 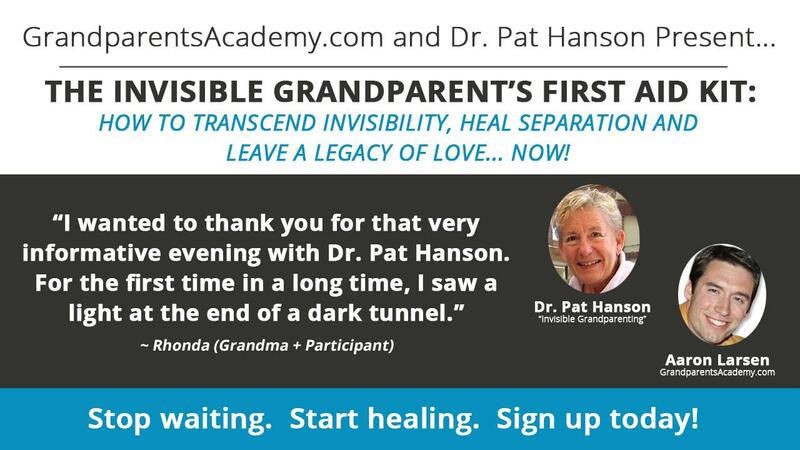 In this workshop lead by Dr. Pat Hanson, you'll discover how to transcend invisibility, heal separation and transform negative energy to forgiveness so you can leave a legacy of love now. Aside from being a veteran health educator, public speaker, workshop facilitator, and writer, Dr. Pat Hanson has personally navigated alienation in her own life. Through this experience she has picked up some helpful techniques and processes such as letter writing to help her navigate the storm. Many of her techniques are described in her book, Invisible Grandparenting: Leave a Legacy of Love Whether You Can be There or Not. Which can be ordered at Amazon.com. "Thank you very much Aaron and Dr. Hanson, it really helped and I'm continuing to write those letters to my grandchild. Good letters." "Thank you very much both of you, it was a wonderful hour. And I must say it is such a relief to have other people who go through this type of alienation and separation and understand the pain of it. Just to have them hear some of the story and know that they are out there sharing with a hug is just wonderful." "Thank you both and I appreciate what you do so much and I want to thank you for this opportunity...keep dancing." "Thank you both for starting the healing process." "I wanted to thank you for that very informative evening with Dr. Pat Hanson. For the first time in a long time, I saw a light at the end of a dark tunnel." If you're tired of feeling abandoned and helpless and are ready to take the next step towards transcending invisibility, healing separation and transforming that negative energy to forgiveness, register for this workshop today. You can leave a legacy of love now whether you can be there or not. Let Dr. Pat Hanson show you how. Click the registration button now to get started. Listen in as Dr. Pat Hanson teaches you how to use letter writing to Leave a Legacy of Love Now! Learn how to heal separation, transform negative energy into forgiveness, "hold the high watch" and leave a legacy of love now whether you are able to be physically present or not. Send your letters directly to Dr. Hanson to share and receive feedback! This is a self-paced online video course.